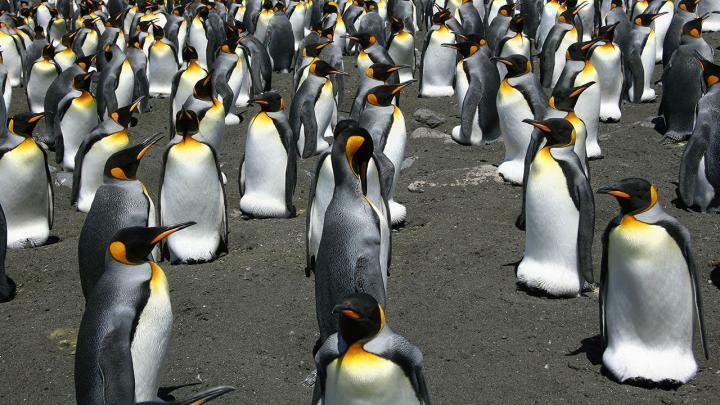 King penguins are threatened by climate change with warming temperatures shifting their main food sources farther south. The new information on how penguin colonies form and structure themselves–and how colonies may depend on the physical features of new breeding grounds–is crucial to predicting the species' resilience. "This liquid state is a compromise between density–or how compact the colony is–and flexibility, which allows the colony to adapt to both internal and external changes," explains senior author Daniel Zitterbart, a physicist at WHOI and adjunct scientist at the University of Erlangen-Nuernberg. "For example, if a pair loses or abandons their egg, it leaves a vacancy in the colony, but we never see vacant spots in our aerial images. Presumably those are filled by penguins that had occupied a less preferred breeding spot." King penguins have a very long breeding cycle of more than 14 months, which leads to a constant mixture of early and late breeders. Zitterbart says the next step in the research is to develop methods to remotely assess the state of breeding colonies. Most colonies are remote and are rarely visited, and only few aerial pictures exist.